Despite the Mid-South being just past the coldest period of the year according to climate records, our current stretch of 55°+ days, which stands at 6 and includes a few mid 60s, is the longest such streak since Nov. 19-24. That is about to end though, as a cold dome of high pressure over the Rockies shifts east across the northern tier of the U.S. Today will be the last day in the 50s for several days. South of the high pressure that moves by to our north, a low pressure system over south Texas will get its act together and also move east along the Gulf coast. The Mid-South ends up in a squeeze play with cold air from the north moving in as moisture wraps around the low to our south. This is one of our classic winter weather patterns, but it always depends on the details, which are never the same from one storm to the next. How cold will it get and how much moisture will be present. As usual, the intersection of the "just cold enough" air and available moisture will be right over the region. There is still disagreement in the models on the amount of precipitation and degree of cold air. Yesterday, most models were still in the "no precip" camp, but they are coming around. NWS forecast position of the low pressure responsible for potential Mid-South snow. The "Gulf low" track is a favorable one for the production of snow in the winter in Memphis. Light rain looks to move into the area during the day Thursday, though most precipitation will remain over MS, so only light amounts are expected with temperatures in the 40s. By Thursday night, air temperatures cool into the mid 30s as light rain becomes more likely with the low over coastal Louisiana. Temperatures will probably fall to the mid 30s by dawn Friday morning. It is from this point on that we consider the potential for a rain/snow mix - through the day Friday as the low moves along the northeast Gulf coast and a trailing upper level trough moves through the region. Temperatures at the surface will likely stay in the mid 30s all day Friday with precipitation falling, then fall to near 30 for a low Saturday morning with precip ending Friday evening. So, tell us straight - how much are we talking and schools be cancelled? I have NO IDEA about schools, and they aren't making a decision this early anyway. The scenario could completely change by Friday morning. A couple of degrees either way could result in snow amounts ranging from nothing to a few inches based on the amount of precipitation expected. For now, plan ahead for all possibilities and let those paid to make those decisions Friday morning do their job, which always involves the safety of the children over anyone's convenience. 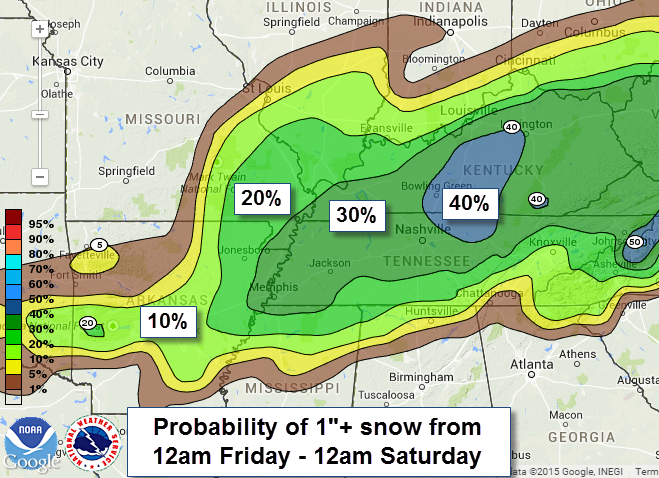 From the NOAA/NWS Weather Prediction Center - probability of 1" or more snow on Friday. A low chance of 1" doesn't mean no snow however. Finally, a word about content you might see on social media. 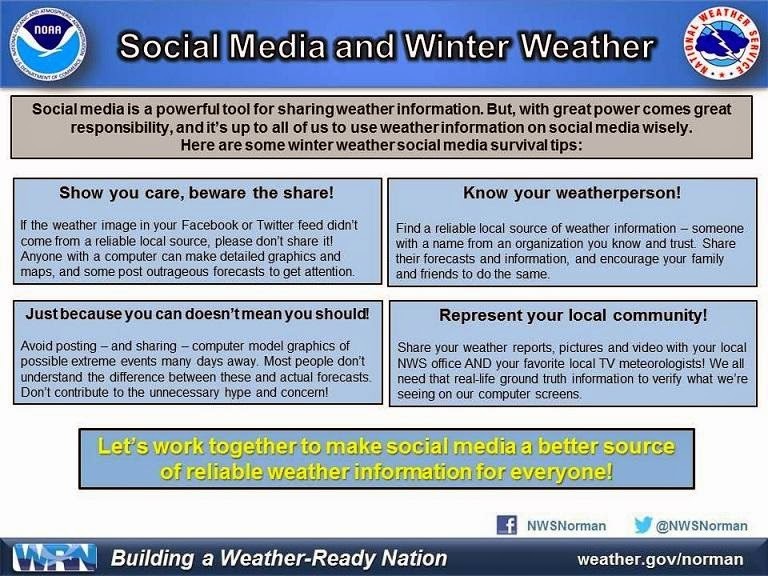 The graphic from NWS-Norman (Oklahoma City) below sums it up very well. "Beware the Share" - don't share stuff that doesn't pass the eye test or is from a source you don't know and trust. Anyone can draw a map of the worst case scenario and post it as gospel. We'll update again as new information arrives or our opinion changes, but no later than Thursday afternoon. Any intermediate updates will be posted on our Facebook and Twitter feeds. 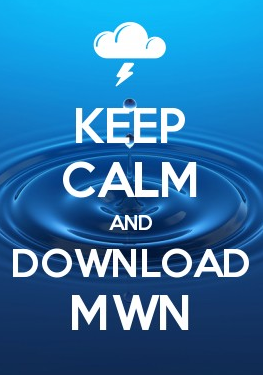 Download our iPhone or Android apps, featuring StormWatch+ severe and winter weather alerts! A reprieve from the January cold!